During festivals in Japan it is customary to shout "Tamaya!" or "Kagiya!" when the fireworks are lighting up the sky. I knew about this, but I had always wondered why they would shout something like that. Now I know. Oh! Edo Rocket is about a firework maker named Tamaya Seikichi and his friends in Edo during the mid-1800's. A time that was hard on anyone with a profession that leaned more towards entertainment and suchlike, well to be quite fair it was probably hard on most common people living in Japan during this age. I normally don't write reviews about animes I have given a high rating, I'm not good at praising things, but I felt I need to hype this anime up a bit since it's clear that it's not a very popular anime, atleast not here on MAL. I'm going to start out by saying that this is a fairly original anime, not just because it's about a firework maker, not just because of the mix of character design and art, but also because of the themes that the anime lean towards. It is common to see comedy and drama mixed together, but it's not common to see the kind of comedy you usually expect to find in parodies and spoof animes such as Sayonara Zetsubou Sensei or Pani Poni Dash! just to name a few mixed with sometimes very serious dramatic scenes. I especially liked the few, subtle, but very funny references to other anime, fairly recently produced anime at that. There was a story in Oh! Edo Rocket. Initially you don't see it, but after a while you realize there's actually a story that's being told and it actually progresses with one defection at episode 20, but still it's refreshing to see an anime that actually has a story that's not afraid to go in the right direction. I'm getting a bit fed up with all the sidetracking of recent series I've seen. But above all I am getting really pissed off at the fact that most animes have endings that hardly are endings at all, they're either really bad because the manga isn't finished or the money grubbing productions companies might want to make a sequel because they made enough profit so they make cliffhangers that make the movie cliffhanger seem like a good movie (it wasn't, it has Sylvester Stallone in it and I think the director just let him say anything he wanted instead of reading the script). Oh! Edo Rocket has a distinct ending that actually ends the anime. Well to tell you the truth there are two endings, imagine that! Oh! Edo Rocket is a mix of crazy comedy and serious drama, and like the fireworks that feature so prevelently, it explodes wonderfully. The show doesn't take itself very seriously at all. The show is heavy with humour, and is quite fond of self-reference, as well as some pop culture (Such as the very apt 'Men in Black'). It also has no problems breaking the fourth wall (ie. admitting it's fictional), and you'll regularly see modern conveniences, such as the TVs used to show some flashbacks. The humour is well executed, and despite the numerous comedy series I've seen, I never really felt this series' humour to be rehashed/stale. When the show isn't being funny, it's likely going through a fight scene. Yes, I said fight scene, and there are a fair few of them, I won't spoil why. The fights felt pretty standard to me. Decent, but nothing special. Between the humour and fights, there isn't really a lot of space, so you could be forgiven for thinking that's all the show has, but somehow, they managed to sneak in a serious drama amidst all the craziness, and it gradually grows to take a firm place in the series. Saying anything more would probably spoil it, though. The show does start to slow down near the end, but you'll probably have already decided if you're sticking with it by then. The artwork is quality as far as I can tell, all standard styling though. A few characters are SD (stumpy), but I don't consider that a problem. As for sound, well, as usual, I didn't notice much. The OP and EDs weren't anything special, but they felt appropriate. The OP DID annoy me though, as the first few 'riffs' sounded nice, but then it just went silly. I felt kinda cheated. Summary: In my opinion, this is a great comedy series. There IS some good drama in there, but the comedy is the star. If you're not into comedy anime, I can't say this one would change your mind. If you like comedies, then I see no reason to leave this series off your list. One of the best Anime I've seen in a while. I watched this show with the English Dub. If you watch it in English you will find it generally stays true to the story however, some Japanese references will be lost and put into a reference people in North America can understand. One example is in one episode you will hear them talk about Shows from North America like Dexter and the mentioning of HBO. The Show takes place in the Edo Period of Japan, it's a time when many forms of entertainment have been outlawed, One of the people affected by this Sekichi Tamaya, a fireworks manufacturer tries to put on shows for the entertainment of the people of Edo but he quickly finds himself dodging the authorities who try to arrest him for breaking the law, he comes upon a mysterious girl named Sora who asks Sekichi to build him a rocket to the Moon and that is how Oh Edo Rocket begins. What I like about this show is that it perfectly balances the Serious and the Not-So-Serious, it knows when to be funny and when to advance the plot. The story is very well-written, High Marks here for originality because i never thought I'd be seeing a story like this. The Artwork in the story is rich, vibrant and full of color. I still have no idea why Shinza, Santa, Rokube's Wife and Rokube are drawn so radically different from some of the other characters, If I can ever get to ask Mr. Mizushima about that, it will be the first thing I do. The music in this show is fantastic and it's very memorable, but it will likely appeal to those who enjoy Jazz music like myself. As for the English Dub performances, this is probably one of the best English Dubs I've heard, Vic Mignogna has a lot of Detractors, there will be people who hate him and people who like him on a personal level. Some people say there were roles he did ruin. I think Vic is a great actor when he is given roles that are very strange or bizarre, his Character in this one, Tetsuju is probably one of the funniest characters ever written for an anime, I can tell you that once you see him in this role you will likely agree with me that this and not Edward Elric is the best role he's done in his career, he pretty much steals the show everytime he's on screen in this one. I would definitely say the one problem with this show may be that it maybe went six episodes too long. A major plot point wraps up on episode 20. However, as I look at the episodes beyond 20, I think there would be a few things that the audience would be clamoring to find out if it ended at 20 that only get resolved in the final couple of Episodes (I.E. Genzo's fate). Overall, Oh Edo Rocket is worth checking out if you are clamoring for something unique and different. It's not for everybody but if you want to laugh hard, this is the cure! 5-OH EDO ROCKET(yeah......and beautiful one of a kind masterpiece of a thriller comedy). 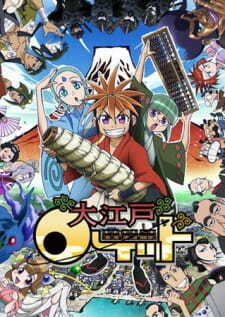 STORY-story is wonderful completely unique and authentic THAT WHY ITS ONE OF A KIND MASTERPIECE.it had more action and fight,bit blood shed and huge mystery to it.a lot of secrets and plot twits are happening so if you miss an episode you will be sorry.its a bit adventurous type anime so no echchi then you have to give comedy to the its fullest right?don't worry it does deliver what is promise and like sugar on top a true love starts to bloom in all this craziness thats happening.the ending was well superb as well just like the beginning you will never guess what can happen in the next episode. ART-was very different for each and every character this was the fist time it was done...well when you WATCH this anime a lot of THINGS HAPPENS FOR THE FIRST TIME FOR THE HISTORY OF ANIME THE CHARACTER THEM SELF SAID IT :3 it was very humorous using different technique for characters and also for the surroundings. SOUND-was brilliant very beautiful and catchy i wasn't tried of it at all and kept me upbeat and energized for the episodes to come,i love the both OP theme and two ED theme songs it expressed the anime theme very well to the fullest.